Anne Hathaway lost 25 pounds for her role of Fantine in the upcoming movie adaptation of Les Miserables. The actress says she became obsessed with losing the weight, which involved eating very small amounts of food. She lost the first 10 pounds before she began filming the movie and lost the remaining 15 pounds while on a two-week break from the film by eating only two thin squares of dried oatmeal paste a day. "I had to be obsessive about it -- the idea was to look near death," Hathaway told Vogue magazine. "Looking back at the whole experience -- and I don't judge it it any way -- it was definitely a little nuts. 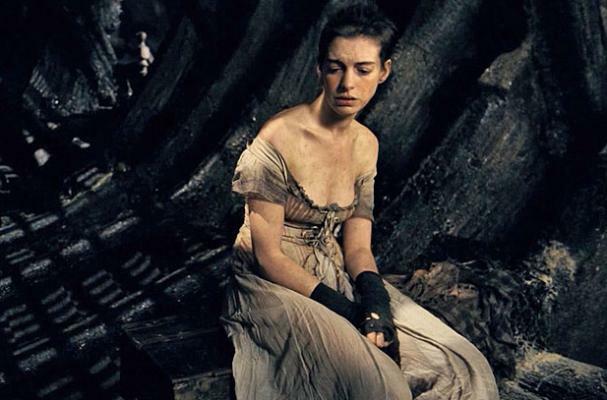 It was definitely a break with reality, but I think that's who Fantine is anyway." Hathaway previously mentioned that she lost the weight for Les Miserables while under the supervision of a nutritionist.